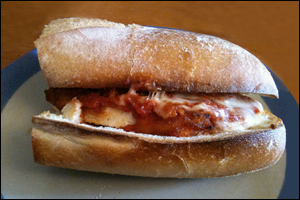 Close your eyes, and imagine sinking your teeth into a sandwich stacked with crispy chicken, zesty tomato sauce, and gooey cheese. Open your eyes... The recipe is right here, and it's guilt-free too! Place cereal in a sealable plastic bag, seal, and finely crush with a meat mallet or other heavy utensil. Transfer to a wide bowl, and stir in seasonings. Place chicken in another wide bowl, top with egg substitute, and flip to coat. Shake to remove excess egg, and coat with crumbs. Bring a skillet sprayed with nonstick spray to medium heat. Cook chicken for about 5 minutes per side, until cooked through. Still in the skillet, top chicken with marinara sauce and cheese. Cover and cook for 1 minute, or until cheese has melted. Place chicken on the bottom half of the bun, and add the other bun half. Dig in! 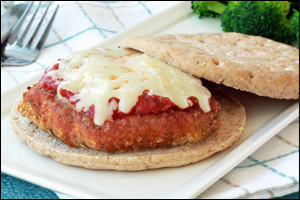 We're pretty sure that nobody in the history of food has ever bitten into a chicken Parmesan sandwich and thought, "This is one healthy meal!" Whipping up this thing is like a master class in making a super-fattening dish: Take a piece of deep-fried meat, cover it with sauce and cheese, and put it on an oversized bun. For us, making over this sandwich was like a master class in Chew the Right Thing: Take a lean chicken cutlet, coat it in high-fiber breadcrumbs, top with low-fat marinara and light cheese, and put it on a flat bun. You too can master the art of guilt-free sandwich assembly... Hope you're hungry! Italian-food-loving pals need today's recipe. Click "Send to a Friend" to share, share, share! If you're in the USA, don't forget that today, November 5th, is Election Day! It's also Donut Appreciation Day. If you decide to grab a treat after you hit the polls, make sure you read this donut info first!